The Kalcyon e-book is officially live on amazon for pre-order. January 31, 2016 is the release date! Kalcyon is slated to be officially released on January 31, 2015, however this will only be the paperback and e-book version. I am going to try my very best to get the hardcover version finished by this time as well, but the company I use has a somewhat slow turnaround rate for proofs. I am keeping my fingers crossed though. This is such a surreal moment for me. And the best present I could have given myself for Christmas! I hope you all have a great holiday, and if you do have the chance, read my first book, Karnage, to get ready for the release of Kalcyon! You can find Karnage on Amazon or Barnes & Noble. Leave me a review and tell me what you thought! I am officially in the final stages of completing the Kalcyon Advanced Reader Copies to send out to readers! If any of you have ever tried to format a manuscript into book form on Microsoft Word, then I know you understand when I say it is a FREAKING NIGHTMARE. I’ve done it twice already, once for the Karnage (paperback) and another for the Karnage (Hardcover), and the level of infuriating did not decrease this time around either. I’m not a Microsoft Word wiz or anything, but I do consider myself pretty technologically savvy, but even with the countless articles from google that I read, I’m pretty sure the process I had to go through was the bootleg way. I swear, by my third completed manuscript, I will figure it out! Anyways, I’m super excited since the formatting is all good now and I’ve submitted the files for review, which means I’ll be ordering them within the next few days for shipment! I thought it was the best day of my life when I held the first physical copy of Karnage in January 2015, but it’s doubly exciting to have the second installment of my trilogy underway. And I just know I might die a little (or a lot) the day I finally complete The Phoenix Ashes trilogy. It’s all still very surreal for me. I still look at Karnage time to time and wonder to myself how I ever finished it. I’m still hosting my ARC giveaway for Kalcyon. Click here for how to enter! I’ll be sending them out before Christmas! It had been imprinted into me the moment I was born and the silent oath clung to my heart. I wanted everyone to experience this marvel: to help them feel their heartbeat chase the one before; to have life electrified into their nerves that it brought a tingle to their fingers; to show that air was not just meant to be breathed, but absorbed. Life shouldn’t be a wish. It was a God-given gift we were meant to take hold of. Also, the price of Karnage has been reduced to $9.99 on amazon.com. So grab your copy before the release of Kalcyon! Where do writers come up with some of their stories? Some of the worlds created in these portable pieces of magic we call books, are insanely descriptive, as if they truly exist. And whether it is in our minds, or another dimension we cannot see, these worlds are real to those who read it. So the question is, where do these authors come up with their ideas for books? Sipping on a piping hot cup o’ joe in a small nondescript cafe? Venturing the blazing deserts of Egypt? Dreaming during a very deep REM cycle? Spinning around in the office chair making sense of the passing blurs? I’m positive the experience is very different among the millions of writers out there. One thing I do know for sure, is that these ideas come completely unannounced, so you really need to be ready for it. You know that feeling when you leave your house in the morning and the sky is shining blue–a few clouds shaped as bunnies pass by–but then all of a sudden it starts to rain and you don’t have an umbrella, so you get drenched? That’s what I feel like when I get an idea and I don’t write it down, and I’m sure I’ve lost one too many good book ideas this way, which is why I always carry around a notebook. I’m old school like that. Yes, I know we live in a time where technology is prevalent in all aspects of our lives and I can bust out my handy-dandy iPhone 5s (did you see what I did there??) 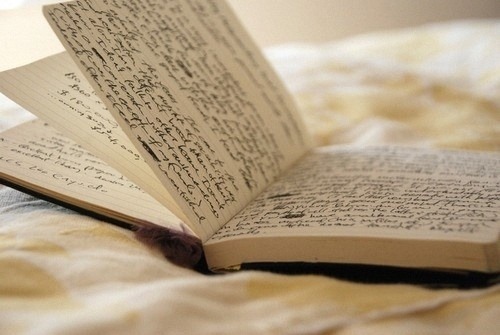 and type my idea in my notepad app, but I love notebooks and I love to scribble. I have notebooks galore. I never really need them, but if I come across a beautiful one, then I can never really say “no” to buying it. My shopping addictions aren’t the point of this article, the point I’m trying to make is that I think everyone should carry some form of paper & pen with them at all times. You not only want to write sudden epiphanies and ideas, but you also want to be able to draw, and you will always be limited with the ability to draw on your phones–the screens may be getting bigger, but your fingers aren’t getting any less fatter! There are actually scientific studies that say those who practice the art of paper and pen (ok, it’s not actually called that) are more productive and creative. I imagine it has to do with the way your mind works. Your brain is shooting specific nerves to make your fingers move to click the right button. When you type, you’re just clicking a button, each button has a different letter on it, but all in all at the end of the day, it’s still just a button. Your fingers move more by muscle memory as you’re taught at a young age that your left index finger rests on the letter “f” while the right one should be on the letter “j.” However, when you use a pen to write, you are physically moving your hand to write the letter “i” and you can’t forget to dot it or it might look like a midget “L.” When you’re actually writing the word, ideas flow naturally through your mind right onto the page. I tend to lean toward blank notebooks (because I’m a rebel and I refuse to be confined to the social standards of using lines! jk). Blank notebooks allow me to scribble, write very tiny for ants to read or very large for giants, and draw as if I’m the next Leonardo da Vinci. Notebooks are like a diary and everyone has had a diary at one point or another (pssst–I still have one today at the ripe age of 24). You can pick up a notebook you wrote passing thoughts in years later and it may strike a chord in you or remind you of something important that you forgot. Those fleeting ideas that seemed trivial may be the next big thing. After a couple days, weeks, or years, if you look back on a simple idea, then you may see it in a different light and it can evolve into a beast of an idea you never imagined it could. It’s 1:30am in the morning on a Thursday and I’m writing about notebooks and pens, while ironically typing it all on a keyboard. Anyway, give yourself a chance to be creative and carry around a notebook/pen for a month and see what you can come up with–I guarantee you’ll be surprised. For every embrace of warmth, there was an icy chill. For every candle paving a path, there was a light being blown out. For every child safely tucked away in bed, there was one trapped in a prison.